1) Do you guys track your practices? How do you track them, the old fashioned way or with an app? 2) Where do you find your swim practices? Do you have a coach or another method? 3) How much yardage and at what intensity do you swim? Does it vary during different phases of the triathlon season? 4) What do you do with your workouts at the end of a season? Do you analyze them to build your next season? 5) What is it that you remember most fondly when it is all said and done? I’m really glad I tracked my practices because it has served me well as a coach, but mostly I’m glad I tracked them because of the memories of my teammates and friends that come back to me when I look at them. In the end, it isn’t the times so much as the experience that I treasure. If I can help someone have a positive swimming experience I’m honoring the experience that I had. So without further ado, here is my version of #throwbackthursday. It is from an early season Thursday practice (9/25/03) from Northwestern, where we WaterBloggers met as teammates. In the morning we lifted weights at the stadium – usually I rode my bike or ran there (wow! like a mini tri!). Sometimes we’d run to the stadium as a team. The practice that afternoon was short course yards. NU Swim Practice 9/25/03. Just over 7,000 yds. The only thing special about this practice is that it was so early in the season, we hadn’t yet divided into our separate training groups: sprint/middle distance & Stroke (IM)/Distance, which means we all did pretty much the same workout. Also, with it being so early in the season (literally the second day of classes) we were doing very drill-centric practices and low intensity aerobic work to build our aerobic base and focus on technique. You’ll notice there are no intervals on this practice – probably because it was so early in the season. This was always a tough part of the season for me mentally because I love sprinting 😉 You can see where I was doing 250s instead of 300s due to an injury and my heart rate was 160 for those. 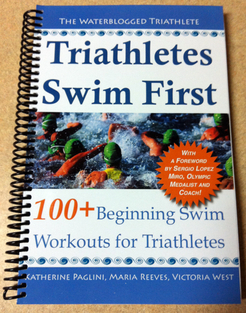 Being the total swim nerd that I am, I also have the original practice as my coach wrote it (in a shoe box). One interesting thing about this practice is that we had the option of doing the last 800 pull or swim. I chose to pull it because you almost never get to pull IM, so that would have been a rare treat. I would have substituted backstroke for the butterfly. 4. I analyze mine weekly/monthly and quarterly….prob. more than needed but I look at my data from all 3 sports A LOT!!! how else can I tell where I need the most work? I have heard a bunch of bloggers mention Training Peaks, will have to look into it. I’ve always tracked workouts the old fashioned way… It sounds like you have a great handle on your training – between having a coach write the workouts, varying the workouts and then actually analyzing everything so often. I’m very impressed! Ooof, 10 x 100s all out sounds very difficult to me now. How often do you do that set? Once or twice a season? How much rest do you take? I wish I was faster than I was in high school!!! lol…yeah…I’m gonna even admit my diddly-squat workouts after looking at a 7000 yarder…but, yes I do keep track of them…not online, ’cause I don’t have one of those smartphones for quick reference while standing at the edge of the pool so what would be the point, but in an old fashioned monthly calender binder. And, yes, I am getting faster. Bwaaaahahahahahahaha…. Well, that was a long time ago – I don’t swim that kind of yardage anymore! I’m like you and track things by writing them down, mostly because that is what I’m used to. It is awesome that you’re getting faster!!! I use Training Peaks to log my own training and to monitor athletes I coach. It’s awesome. I gotta say that we endorse them at my work and have met the people that run the company. They genuinely do care about delivering a great product (I would just say nothing if I thought it was rubbish). I swim with my club but tend to ‘alter’ intensity or miss bits out if its too hard/easy depending on my aims. I rarely look back at old stuff…. Preferring to use iterative coaching methods. I just love training and racing….living for the moment. I have not used Training Peaks yet, but I’m going to give it a try based on these recommendations. I think it says a lot that two of you guys have mentioned them in the comment section on this post. I like your training style and I totally get loving training and racing and living for the moment. Doing something for the right reasons makes the experience so much better and it can be freeing not to have to get bogged down by the small stuff. If you have a good coach, which it sounds like you do, all you have to do is show up and trust their method.